The Association would not be able to operate without the dedication of our officers. These individuals have agreed to serve as officers for a minimum of 2 years. Not to mention that all of the current officers are also founding members of the Association. Chris Edwards was raised in Stratton, Nebraska. Shortly out of high school he enlisted in the United States Navy. Now a retired Chief Petty Officer with over 20 years of faithful service. Of course he performed a wide array of job assignments while in the Navy to include: Military Police with K-9 background, Expeditionary Security Forces, Enlisted Recruiter, Medical Officer Programs Recruiter, Command Financial Specialist, and Trainer just to name a few. 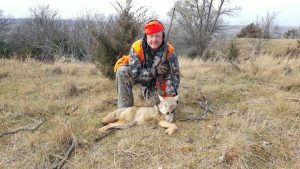 Now he serves as President of Big Game Conservation Association, past President of Big Red Whitetails and is Chairman of the Board of Directors of Nebraska Sportsmen’s Foundation. He is a member of multiple organizations including Ducks Unlimited, Pheasants Forever, Quality Deer Management Association, Veterans of Foreign Wars, National Wild Turkey Foundation, National Rifle Association and Delta Waterfowl. Consequently, his passion for the outdoors led him to start his own business, Big Red Outdoors, in October 2009. It has grown to over 70 members with 8,500 acres of private hunting ground leased in Nebraska. Requiring a better management tool for his club members, Chris worked with a computer programming firm to develop an online reservation system for member use. 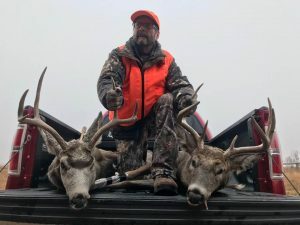 Once developed, he saw a wider market for its use and has since started another company, American Sportsman Network (ASN), which allows other club owners the opportunity to utilize the reservation system. Currently, the ASN has participating clubs in Alabama with aspirations to add a club in every state. Big Red Outdoors is actually the catalyst for driving Chris to the conservation arena as he wanted to learn more about improving the habitat on his leased properties. Big game herd management also led him to use RAKS™ Big Game Supplements on his properties and in April 2013 he purchased the company. His years in the military have given him an unparalleled work ethic, drive to succeed and focus on mission accomplishment. Traits that are key to any successful venture! Martin Weverka has been employed by Pet Smart for the last 18 years as a Store Manager. He also has 5 more years of management experience with Hy-Vee and YABC. Martin has a high school diploma and attended Metro Community College for 3 years and took general education classes. 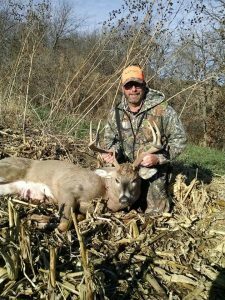 Martin served for 2 years as the Treasurer for the Big Red Whitetails Branch of the Quality Deer Management Association. He is a volunteer/board member for the Clean Lake Council for the past 19 years. Not to mention, he has also volunteered with fundraisers for the Omaha Association of the Deaf for the last 20+ years. Marty is also a current member of Ducks Unlimited, Delta Waterfowl, National Rifle Association, Pheasants Forever, Quail Forever, National Wild Turkey Federation, Nebraska Bow Hunters Association, Nebraska Sportsman Foundation and Quality Deer Management Association. Jeremy is the owner of Cottonwood Renovations, a residential remodeling company serving Lincoln and the surrounding areas. Cottonwood Renovations specializes in complete basement design, along with kitchen and bath remodels. Jeremy also serves as the President of the Big Game Conservation Association – Lincoln Branch. In addition, he is a Board Member of the Nebraska Sportsmen’s Foundation and does consulting work with RAKS™ Big Game Supplements. Jeremy holds his family in very high regard. So much so that he now gets even more enjoyment sharing time in the outdoors with his kids. He loves seeing his kids getting fulfillment while on shared adventures. For this reason he makes time to volunteer for organizations such as the BGCA. Therefore, passing along traditions and educating them in the outdoors is very important to him. John Connell was born in Johnstown PA and grew up in Tupelo MS where his parents still reside. Raised in west Tennessee, John’s father learned to hunt and fish as a young boy. His father passed his knowledge on to John as a young boy. As active hunters, his father and grandfather taught him to be ethical as an outdoorsman. As a teenager John taught himself to trap beaver, muskrat and mink. He has always had a passion for the outdoors and outdoor activities such as backpacking and camping. During his high school years he worked for the federal YCC (Youth Conservation Corps) building trails and conserving plant life, animal life and the history of the Natchez Trace Parkway. After attending the University of Southern Mississippi and University of Mississippi he began working his way into retail management. Now he has 23 years experience in this field. John has lived in the Omaha metro area since 2001 and this is where he met his wife, DeAnna. 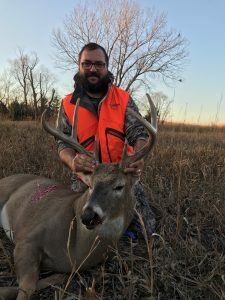 John is a member of several conservation organizations: Big Game Conservation Association, Fontenelle Forest, Nebraska Wildlife Federation, Quality Deer Management Association, Nebraska Firearms Owners Association, and Ducks Unlimited. He is also associated with Big Red Outdoors, East Nebraska Gun Club, National Rifle Association, and International Hearing Dog Association. Rick Langstraat was born and raised hunting on the farms of Iowa. After a 22+ year career in the Air Force, he retired as a Master Sergeant. He and his wife Lucy relocated to Nebraska in 2003 continuing to serve the US Air Force as a Civilian, then transitioned to the US Department of Interior, National Park Service in 2015 where he works in the Midwest Regional Office, Internal Controls Office. 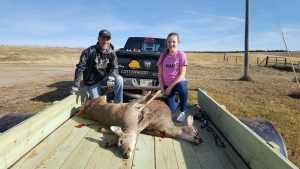 Rick is a founding member of the Big Game Conservation Association and proudly supports other conservation clubs such as Ducks Unlimited, Pheasants Forever, and Rocky Mountain Elk Foundation to name a few. 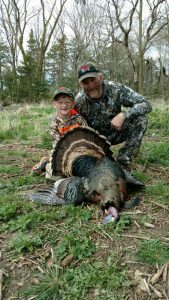 He is also a volunteer instructor with Nebraska Game and Parks teaching bowhunter and firearm hunter education and tree stand safety. He’s a life member of the NRA, The North American Hunting Club and the Veterans of Foreign Wars. Furthermore, affiliations with the Nebraska Bowhunters Association, the Eastern Nebraska Gun Club, the Nebraska Firearm Owners Association, the Heartland Chapter of the North American Versatile Hunting Dog Association, and the American Wirehaired Pointing Griffon Association demonstrate his passions. As a family man, he’s deeply involved with his sons’ scouting adventures. Of course, he is an assistant Den Leader for Pack 206 (Cub Scouts), and an Assistant Scoutmaster and Merit Badge Counselor for Troop 888 in Papillion (Boy Scouts). Appointed by Governor Heineman in 2014 to the Natural Resource Commission and reappointed by Governor Ricketts in 2016; Vice Chairman 2017-present, Chairman of the Rules Committee 2014-2016, Member of Grant Approval Committee 2016-2017, Member of the Rules Committee 2016-present and Executive Board Member 2014-present. Scott Smathers is involved heavily in the outdoor arena. This is on both a professional and personal level. It is to help ensure, protect and enhance our traditions and heritage for future generations. Hunting, fishing and the outdoors were a key factor in his upbringing. As a result he has a strong belief that the traditions and rich values of family, honesty and strong moral fiber are learned from being active in the outdoors. Not only being a steward of our natural resources but preserving it for current and future generations. Not only is this his obligation but his passion. Scott is married to his wonderful and supportive wife, Angie and also the proud father of two grown children, Nicole and Zach. He is also a grandpa to two amazing grandchildren. Not to mention, he is owner of three wonderful dogs and uncle to 5 fantastic nieces and nephews. Of course he is teaching them about the love of the outdoors and the rewards it provides. Scott lived in Nebraska from 1974 to 1980 and again returned in 1985 where he has been ever since. Thomas was born and raised in Omaha, Nebraska. Consequently, much of his time is spent outdoors enjoying nature while hunting and fishing. He is also a member of Big Red Outdoors hunting club. Of course Thomas also enjoys going biking, kayaking and photography. He is a hands-on, results oriented individual. As a result, that expertise translates into solid customer service, client relationship and problem solving. He has utilized his skills while working for Centurylink Telecommunications, his employer of 18+ years. Thomas is looking forward to utilizing and increasing his knowledge of game conservation and management of Nebraska’s big game resources. His anticipated # of work hours with BGCA would be a minimum of 80 hours per year. 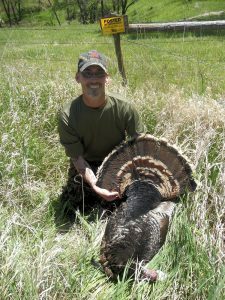 Thomas is a current member of the National Wild Turkey Federation, Nebraska Bowhunters Association, Nebraska Sportsmen’s Foundation, Quality Deer Management Association, Rocky Mountain Elk Foundation and a Life Member of the National Rifle Association.